One of the advantages of playing golf is that generally, wherever you go, you can find some sort of random course for you to hack in, which makes for some great time wasting opportunities especially when you are on a family holiday and you just need to escape for an hour or so. So anyways, I ended up staying in Rasa Sayang Shangri-La in Batu Feringgi, Penang. 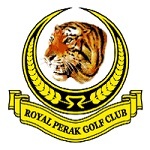 Now Penang is like our second home, but strangely I’ve hardly played on any courses in Penang. 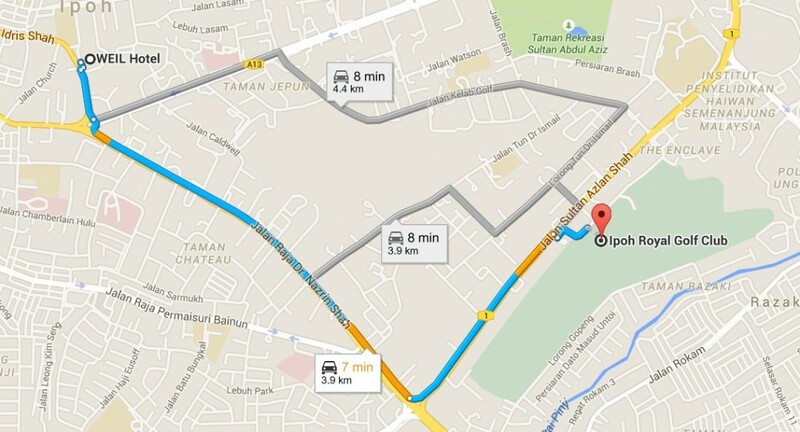 Among the northern courses hacked – Kulim, Bukit Jawi, Harvard. It’s strange, because I’ve never stepped anywhere into Bukit Jambul (now called Penang Golf Club) or Penang Golf Resort at the mainland. It’s probably because we are too busy stuffing ourselves with food. In fact for this trip I ate so much, I am going on a 6 month detox program eating only lentils and cabbages. Anyway, you think these were the other two courses? Because if I was a bird, I would see this suspicious looking terrain at the place I am staying and immediately zone in on this opportunity for escapism. Now this review is going to be a short review – not meaning the capacity of the writer, but the fact that the review is not a full review. Simply because nobody would actually travel 200 km to purposely come and play this course, unless there’s something wrong with you or something special about you and you travel around the world searching for the greatest pitch and putt course to play on. So there will be portions where the normal review points are not applicable. Ah heck, it’s just for fun anyway. The price is RM25. If you think about it, it’s pretty ok for a nine hole course. 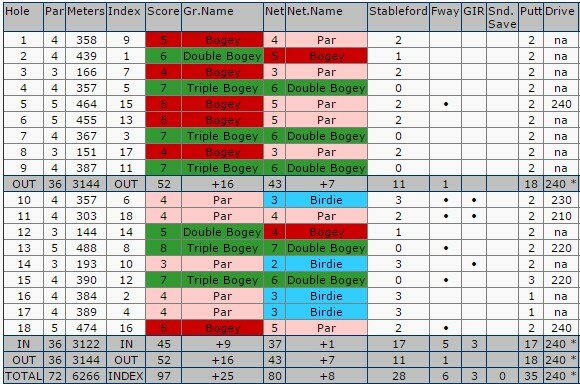 But once you take a look at the scorecard, it’s not even a pitch and putt. It’s more like a chip and putt. Or a putt and putt. Because some of these holes are at 20+ meters, and my absolute retarded short game, there’s no way I can hit that distance accurately. 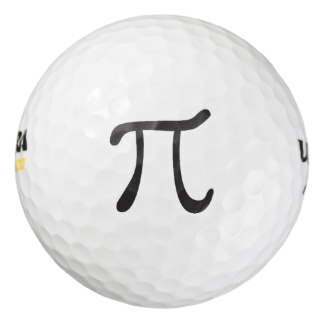 The total yardage is at 324 meters, around the length of an average par 4. It’s a very very tiny course, not comparable to the other pitch and putt reviewed – that awful junk course at Jelutong, but it’s a resort feature for crying out loud. Some of the readers is probably going – give it a break, will you? I think it’s ok to pay 25. I would imagine a pricing around RM15 would make more sense but you are already paying through your nose for the resort anyway, so at 25 to escape an hour? I think it’s fair. Umm. You take one look and that’s it. The whole course is built on a space that was possibly reserved to build toilets I think, because it was a very cramped area. However, kudos for the hotel to actually put in a course here, as opposed to those pathetic mini golf where you need to putt through the windmill and stuff. There’s even a practice green in there and a nice club house (hut), with a bunch of rental clubs and balls for you. The gentleman servicing the club house was a nice friendly guy (maybe because so few patrons actually come by the golf course). He was actually refreeing a putting competition with two foreigners there and asked if I wanted to join. It was quite obvious the two gentlemen had been practicing on the green for some time, but I said sure and paid the RM10 entry fee and proceeded to randomly select a half destroyed putter circa WWII and putted for the first time on a very lousy green. The clubs there are very old, very rusted and probably used by Vijay Singh’s great grand father. But it seems like an overkill to bring your shoes and your own golf bag when the other folks there were dressed in slippers, shorts and a Chang Beer singlet, you know. Anyway, I came in second, which isn’t bad because the guy that won actually sank 2 15 footer putts. You probably can’t expect much, and you won’t get much. The greens are well…just flatter and have shorter grass than the rest of the course. The roll is non-present, but again, this is a resort feature, so why get mad? Let’s just park a 1 in there for effort. The rough – primarily the few bunkers featured in the whole course – is surprisingly well kept. In fact, these are better than some of those monkey courses like Kinrara or Bukit Unggul. Kudos Rasa Sayang! Then again, they only have to take care of like 3 bunkers so how difficult can it be? The whole course more or less plays the same. You need to get our pitching up to speed and all holes look alike – tee box, maybe a bunker here and there and a bad, hairy green. What more do you expect? You probably won’t organize a full flight here. Unless you are seriously demented. If you are anything like me, you will probably stumble into this course (located inside the resort and following the cryptic ‘Golf’ signs’) and you will be using rental clubs and balls. However – it’s quite a good place for you to get better at your chipping/pitching (not putting). It’s like a big backyard for you to practice. You can wear anything except your underwear I guess, and even after the game, you have a water dispenser and a cool towel at the club hut. The only hole where you can probably hit anything more than a quarter swing is the last hole, measure at around 64 meters. Even that, I flew my 60 degrees with a half swing. At least I got a chip in birdie! 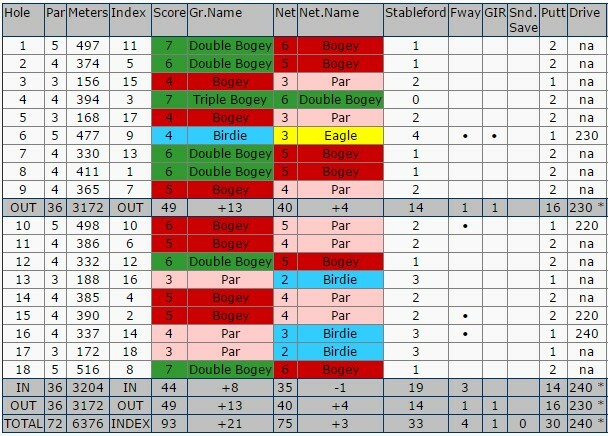 But as you can see from the scores, my short game is absolutely flawless like how an iguana would be flawless dictating Charles Dicken’s Tale of Two Cities. The novelty kind of wears of after the 4th or 5th hole, and you are like, “I could be in the pool with my kids instead of suffering trying to flop this stupid shot onto this stupid green and then trying to sink in that stupid putt.” If you are good, you will be bored to bits. If you are anything like me, with a short game resembling that dictating iguana, you will generally be in constant pain. I played all holes with a sand wedge and a chipping stroke but the feeling was similar to when I was extracting both my wisdom tooth at the same time. Short game is a pain, but it’s necessary. I paid RM25 to remind me of that. The good: It’s escapism for an hour or so; the service is friendly like what you expect from a top grade hotel. The bad: This is a pitch and no-putt course because the greens are bad; the rented clubs are what you would expect from rented clubs created in the 1930s; the course is very short and cramped, with workers lounging around pretending to be your gallery; makes you want to go back to the pool after the 5th hole. The skinny: 13 of 30 divots (43.3%). I won’t say this is a total miss. If you are in Penang, you are probably too busy eating so this golf course should only be tried if you have absolutely nothing better to do. Otherwise you probably want to take a dip in the pool, relax at the spa or go Penang Road and eat some solid Char Kueh Teow and Chendol. 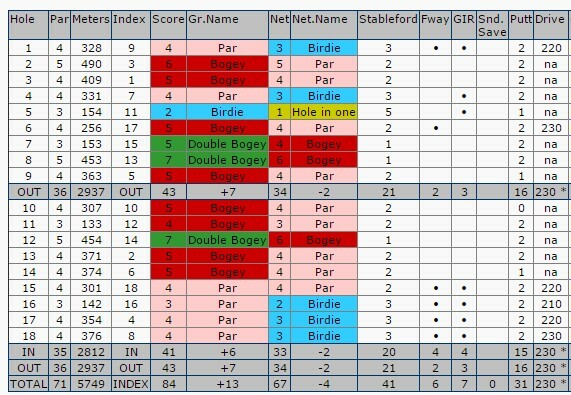 In an earlier post, I still concede I don’t play a 100% honest golf. In most cases, when my ball is nestled in the rough around tree roots or rocky ground, I’ll pick it up and drop at a better area. Yes, I do it, and no I don’t penalise myself, so yes, technically, that is dishonest. But today I played in a tournament in Seri Selangor. So there is no such thing as picking up my ball etc, and my ball ended up in the jungle (which is normal for Seri Selangor). 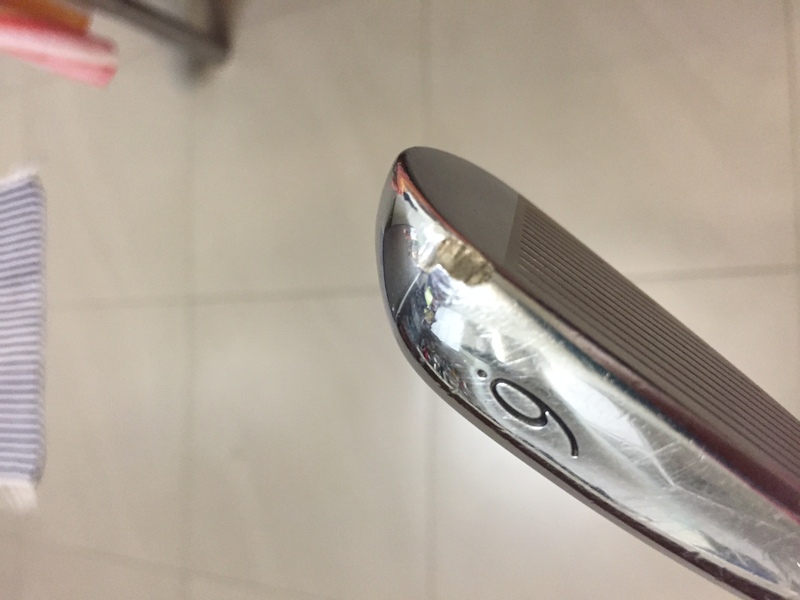 The ground was rocky and there were roots, but it seems ok, tiny rocks, which I suppose would just scrape my beautiful Mizuno irons. 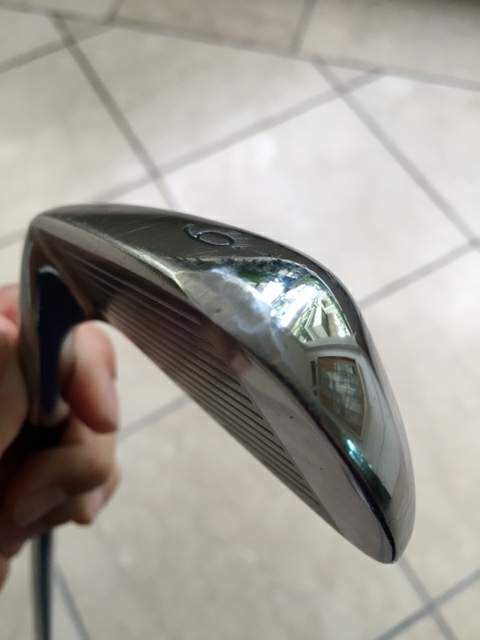 I hit my 6 iron to punch out – and lo and behold, there was a huge brick buried beneath my ball and when I hit the ground, my ball flew, and the large back cracked in half at the impact and rocks splatter all over. 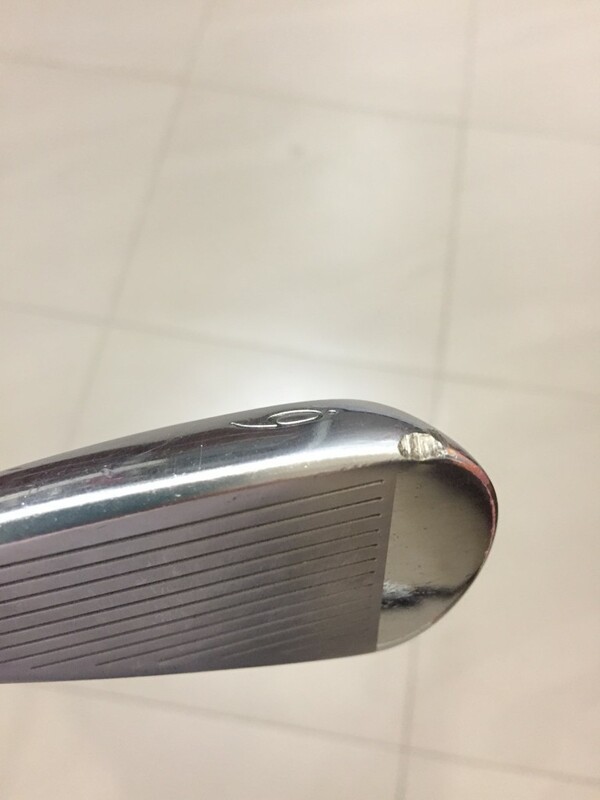 The horrifying dent on my 6 iron is now for all to see. Thank you, Seri Selangor for burying bricks and destroying my club. AUGH! 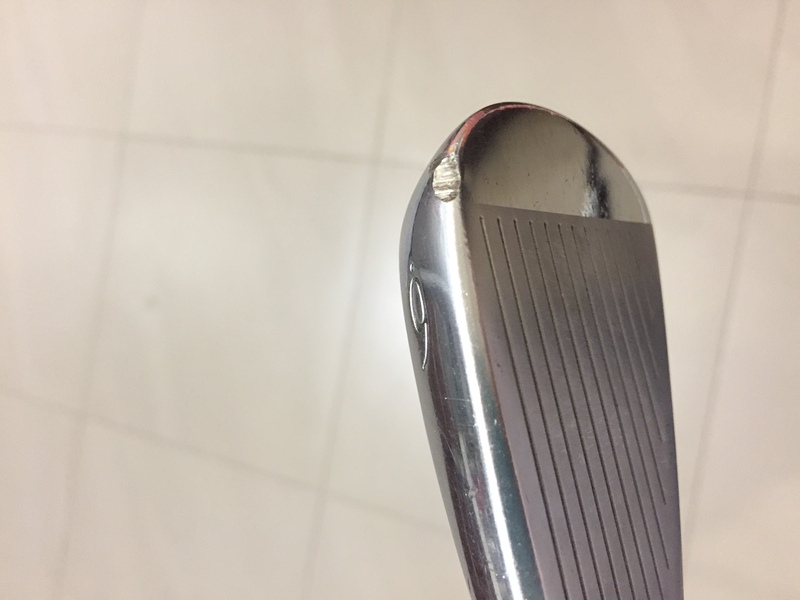 Does anyone know where such huge craters on my irons can be fixed or buffed out? 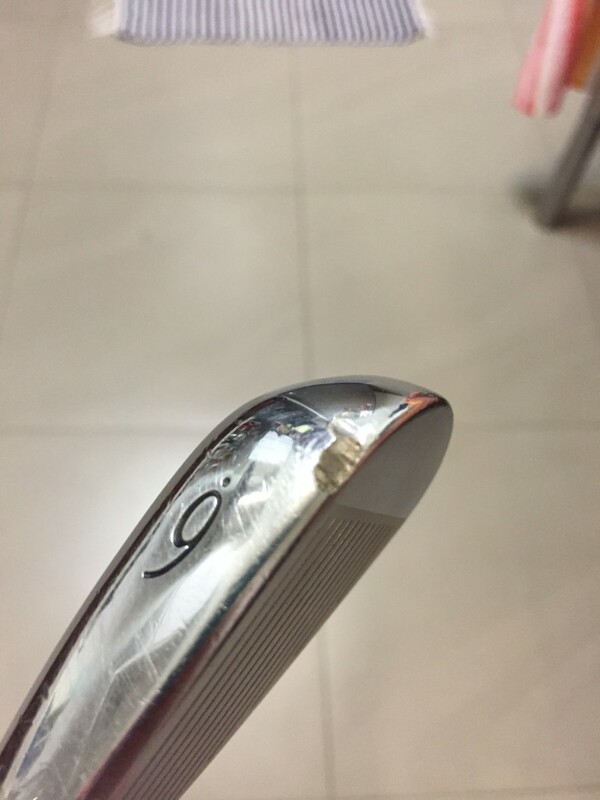 Any recommendations of golf repair shop in KL/PJ area?